Is one of the blocks to your taking up a meditation practice a fear of being uncomfortable sitting still on the ground? Or maybe just fear of not being able to sit still at all? Set an intention before you begin. Why do you want stillness in your life? Visualise yourself on this path of mindfulness. Sit on pillows and blocks. Even fold your jumper or jacket and sit on that. There is nothing wrong with sitting up on something. It elevates your hips, straightens the spine and helps open the chest. Embrace that perfect posture and let the energy spiral up your spine! Meditate in a chair. You can still have a meaningful practice sitting up a chair. Get comfy and wear sweats. Give your belly and chest room to fully expand as you breathe in. Use essential oils for aromatherapy. Lavender. Juniper. Rose. How can you delight more of your senses so that the mind can just be at peace? Load up on alkaline foods and green vegetables. Your body will have an easier time digesting and energy can be spent elsewhere. If the legs fall asleep, let them be for the moment. Stay calm and breathe deeper. It is just a sensation; how can you rise above these sensations? Breathe into any spot that starts to feel tender. Visualize healing coming to that part of the body. You would be surprised at how well this helps. Try sitting on a sheepskin rug. It feels like heaven and was the traditional mat of choice for ancient yogis. Stretch your legs at the end of each day. My favorite: lie down with your legs up against the wall and back flat on the ground, like you are making a “L” shape. 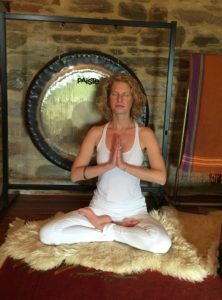 Begin long deep breathing and feel the beautiful release in your quads and hamstrings. Practice daily and be patient. I promise it gets easier and any initial discomfort is worth it. Big note: If you are meditating and your teacher unreasonably will not let you get up or be comfortable, it is not worth it. The mind must be calm and feel safe in order to surrender. Find a new practice. This is great. Thank you Heather. Normally advice on how to be mindful or overcome restlessness is very vague or ambiguous. I love your actionable recommendations here and will start implementing as many of them into a daily routine!